My father is a sailing enthusiast and has a sailboat that he and his wife enjoy sailing in the Gulf of Mexico. When they retire they plan to sail more extensively-possibly full time. Dad is an engineer by trade and has a great deal of understanding about the scientific principals upon which sailing is based and how to actually sail said boat. Personally, I couldn’t get one away from the dock, but it is pretty cool to bump around on the water as long as there is an experienced captain and crew on board. There is a specific order of operations that I am getting wrong. You must FIRST have a personal relationship with God BEFORE he can reveal your purpose to you. It makes perfect sense even if you look at it academically-would you take monumental advice regarding your life from someone that you didn’t know or have any type of relationship with? Unlikely. On to the sailboat. A single-hulled sailboat, like that of which most of us envision when we think of a “sailboat,” must have a “keel” and a “rudder.” Pictured below is the underside of a sailboat. These two features are inter-connected, inter-dependent and essential for the successful operation of the sailboat. The keel (large fixed fin at the very bottom of the hull) has two main functions: to keep the boat from being blown sideways in the wind (lateral resistance) and to hold the ballast (weight traditionally at the bottom of the keel that keeps the boat right-side up). 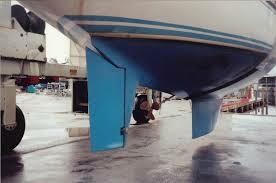 The rudder (moveable paddle in the back) in very simple terms-steers the boat in the direction in which you desire. One without the other makes for a pretty useless, and possibly dangerous, sailboat. The keel is akin to our relationship with God. It is absolutely necessary-FIRST. Without it we cannot even keep our lives “right-side up” or the wind from blowing us at its whim. One we have a keel, i.e. our relationship with God, we can then move on to the rudder which is God’s purpose for our lives-steering us in the proper direction. I’ve got my marching orders and it’s time to soldier on in the right direction with the proper priorities. Thank you for taking time to read my thoughts on today’s epiphany.